Have you heard of the Blitzball? I hadn't until I was asked to review it. There are several videos on YouTube showing how many cool pitches you can throw with this ball, so the kids and I were really excited to try it out. Tristen ripped the package open the minute it arrived and ran for the back yard. 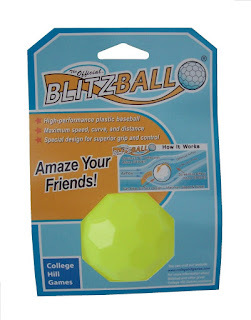 Blitzball is a bright yellow plastic ball, specially designed to reduce wind resistance and maximizes the ball's spin. This allows you to throw some wicked curve balls! 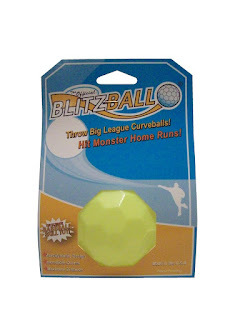 The Blitzball site offers detailed instructions as well as video on how to pitch the ball. The website is very helpful. Our experience with the Blitzball was mixed. The kids really enjoyed playing with it and trying to throw the awesome pitches they saw on the video. It did get them outside and active, which in my books is a great thing. The only problem we had was actually getting it to curve. It seems to be something you really have to practice, something my kids were not real interested in doing. They were bummed that they couldn't pitch like the guys online, but seemed content enough just playing good ol' baseball with it. The adults could get it to curve, maybe every three out of ten pitches. It definitely takes some practice to learn the proper technique. I feel that if you have sports nuts in your life, especially ball players, that they would enjoy messing around with a Blitz ball. If you are willing to put some effort into, you will eventually learn to throw some truly amazing pitches. But, you have to be willing to put in the time. You don't just open the package and turn into a major league pitcher. All in all, it was a fun product that we all enjoyed playing with. It made for some great family time, which is something not many products do. You might want to check it out for the sports lovers at your house.